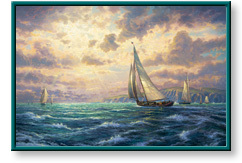 New Horizons and other artwork by artist Thomas Kinkade can be viewed in our artist slideshow. New Horizons by artist Thomas Kinkade and other Thomas Kincade art, art work, artwork, canvases, giclees, images, limited editions, open editions, paintings, paper, pictures, posters, and prints can all be found at Christ-Centered Art. "New Horizons, my third Life Values print, celebrates the dramatic expansion of our horizons that follows the act of courage. "My New Horizons takes us to a timeless harbor of the 18th Century. This classic ship sets confident sail for distant shores under a dramatic sky, as God's rays pour from the heavens, reminding us that, with God's help, our life can be a bold exploration of all that is new and enticing in the world." New Horizons by artist Thomas Kinkade as well as other open and limited edition inspirational paper art prints and canvases, giclees, images, lithographs, paintings, pictures, posters, and reproductions by renowned Lightpost Publishing, Media Arts, and The Thomas Kinkade Company artist Thomas Kincade can be viewed and purchased at special sale prices at Christ-Centered Art.